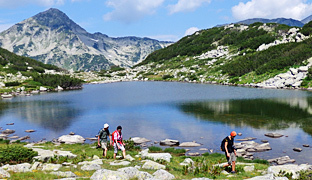 Bulgaria Hiking And Walking Tours. 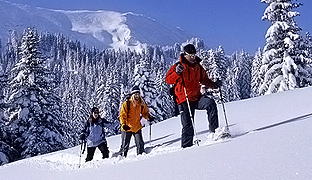 Self-guided, Guided, Independent And Snowshoeing Trekking And Rambling Holidays In Rila, Pirin, Balkan, Rhodope, Vitosha. Earlybird rates! Fixed dates for 2019. 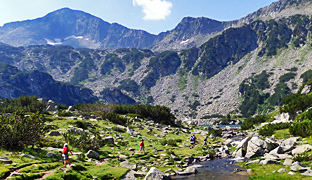 *BESTSELLER* The most scenic trails of the Rila and Pirin, incl. the Balkans highest peaks - Musala (2925m) and Vihren (2914m). 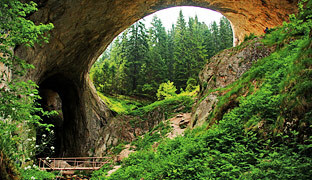 Explore remote and hidden trails in the Rhodope Mountains, reputed to be the birthplace of the legendary musician Orpheus. Bored of the popular European high-altitude treks? You have come to the right place, looking at our most scenic self-guided hiking trek. BulgariaWalking.com (© Traventuria Ltd.) is a leading specialist for escorted and independent hiking and walking holidays in Bulgaria. We offer guided treks, revealing the best of the Bulgarian mountain trails, traditions and culture: i.e. the best of the Pirin and Rila mountains, combi tours of hiking and sightseeing, snowshoeing, one-day hikes from Sofia to Rila (The Seven Rila Lakes and Mount Musala) and Vitosha, centre-based rambling tours in Rila, Pirin and the Rhodopes, the trek climbing the three highest peaks of Bulgaria etc. Revel in the beauty of nature amid winter. Sense the calm of winter magic in three of Bulgaria’s best-loved mountains: the Vitosha Nature Park, Rila and Pirin national parks. A well balanced programme with half-day (or shorter) easy to moderate walks in the Rhodopes, Pirin, Rila and Vitosha mountains, offering more opportunities to visit culture sites. As pioneers in the development of the self-guided walking tours in Bulgaria, we have been continuously optimizing our itineraries to deliver the best value and quality. For moderate hiking we would advise visiting the Rhodope Mountains, while for more challenging trekking you can refer to the Rila and Vitosha mountains or the hardest one - Pirin. Those seeking maximum impressions can go for a combination of Rila & Pirin or Rila & Rhodopes. Based in Sofia? 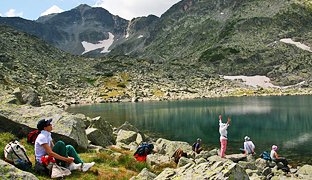 We have a variety of one-day self-guided hikes to Vitosha or Rila (The Seven Rila Lakes, Mount Musala etc.). 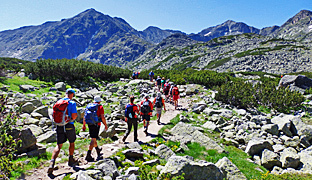 Traventuria Ltd. is an expert agent on adventure tours in Bulgaria, covering the whole range of guided and self-guided (inn to inn) walking, snowshoeing and mountain hiking holidays in Rila, Pirin, Balkan, Rhodope (Rodopi) and Vitosha mountains. Traventuria Ltd. is fully bonded tour operator and holds tour operators license No PK-01-6434.